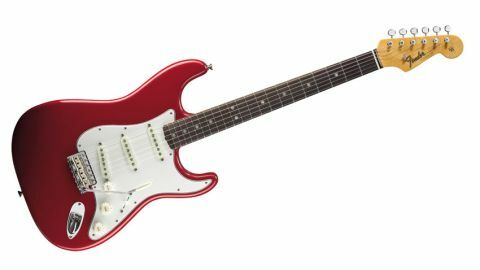 Beautiful, compelling and endlessly desirable - hats off to Fender for going to such great lengths to retool and re-spec its already good American Vintage range from the ground up. Superb tones, spec, build quality and value for money. The old vintage sound vs playability compromise. We'd like more colour options. You've seen more new Strats in the last 20 years than Simon Cowell has auditioned hopeful starlets. When it comes to the guitars, however, there are no embarrassed downward glances, much less any mouth-grasping gasps at the sheer awfulness on display: Fender's 'bad' days are over. Yet just as He Of High Trousers can spot the spark that elevates the exceptional from the mediocre, so it's obvious to any serious Strat fan that the new range of American Vintage models elevates things yet again. Here we examine the '56. Case open, olfactory and visual senses in overdrive, exactly what do we have here? "To some people (weird, unhappy people), all Strats look the same"
To some people (weird, unhappy people), all Strats look the same. Others (ahem) suffer nightmares about incorrectly contoured bodies, the wrong number of pickguard screws, wrong logos and - shiver - a 22nd fret. Solace for the afflicted comes first here in the new all-nitrocellulose 'Flash Coat' lacquer, a significant step on from some nitro finishes of recent times. It still feels like lacquer, that is to say 'stickier' than modern polyurethane or polyester, but not over-soft like a lot of new Gibsons. It's also not mirror-flat like some modern finishes, but we'll take it just as it is. Our experience is that thin, well applied nitrocellulose finishes enable classic guitars to sing better than thicker poly finishes. The colour tint on the maple neck is minimal, too, so it doesn't look like it's been on the fake tan as it would with Fender's Classic Series instruments, leaving an unsightly, anaemic mark should you suffer a chip. "Every indication says that it's going to age gracefully, but this guitar does mark, chip and dent with alarming ease"
Every indication says that it's going to age gracefully, but as we've found out to our cost during the review process, this guitar does mark, chip and dent with alarming ease. The feel, however, is pure bliss. Fender's sales sheets down the decades would indicate that, ultimately, more people like smaller neck profiles than big ones. Thus, the first and second issue American Vintage instruments (early 1980s, late 1990s) didn't feature the full girth and tapers of the true vintage necks. Thankfully as far as we're concerned, Fender has completely reshaped the neck to better reflect the original guitar. Fender calls the '65's neck profile a 'mid 60s C'. It's round, and comes in at 24.4mm at the 12th fret, but it feels smaller than that because there's less shoulder in the profile. We really do like the taper on it, too - the increase in thickness as you go up the neck really adds to the authentic feel. The fingerboard edges are beautifully 'rolled'. Plenty of manufacturers do this as it simulates years of playing up and down the neck by gently sanding off the edges. If you're a fan of old guitars, it's hard to see how you wouldn't prefer this to a new square-edged 'board. On to the rosewood 'board, and the '65 it's a round-lam type (the transition happened mid-'62, driven primarily by how Fender's fret-slot cutting machine worked). With the round-lam design, both the top of the neck and the bottom of the fingerboard are radius'd. It's supposedly structurally more sound, but it can also mean that some of the fret tangs can end up in the maple of the neck (especially after a re-fret or three), which may have a tonal effect. The playing radius is vintage-style 184mm (7.25 inches), which by today's standards is very curvy. Coupled with small frets it means the eyebrows-to-the-sky moment as bigger bends choke out. "It's worth remembering that big string bends were far from the norm, certainly in the 1950s"
It's worth remembering that big string bends were far from the norm, certainly in the 1950s. So, raise up the action a little, put a bit more relief in the neck and now we're cooking. Some people can't deal with it. Others - SRV, Mike Stern, Matt Schofield - insist(ed) on setting up their guitars like this. It might seem like yet another tiny detail, but this guitar has a proper bone nut, too. In our opinion, all these details add up visually and tonally. For instance, Fender went to solid white pickguards using a different plastic in 1965, hence the very white looking one we have on the new '65. Fender has played it straight down the vintage line with the bridge, all the way down to newly tooled saddles complete with 'PAT.PEND.' stamps. Similarly, the team has taken it to the nth degree with pickups, too, by finding and analysing originals to recreate them anew. As such, the '65 has the 'grey bottom' pickups (so called because the fibreboard bottom plates are grey, not black) using plain enamel wire around Alnico V magnets. Even the tone caps are new and period correct and the '65 uses a ceramic disc 0.1 microfarad, complete with the short piece of insulation to prevent a ground connection to the pot. It's a moot point in the face of such efforts, but lots of players choose a lower value cap for more subtle tone changes. Fender can't really win - whatever it does, somebody will want something different! There is a meaty fullness and depth of tone in a vintage-style Strat with all the right bits, that is pretty much non-existent in the entry-level models. Bridge pickups don't sound puny, the in-between sounds don't fall away to nothing, and so it is here. "The '65's overall performance out-punches its sister model, the '59, ever so slightly, with the tiniest amount more edge and bite to notes"
We've tried every combination of Strat spec and materials over the years, and it seems that the thin finishes, correctly selected timbers, the right hardware and electronics genuinely do all play their small yet crucially important roles in getting that classic, big-but-clear sound. Take any one of them away, and the Strat starts sounding not necessarily worse, but different. Relative to the other new Strats in the range, like the American Vintage '56 and '59, the '65 is similar to the latter in that it has a sweet sound with a healthy presence on the cleaner tones. However, it's overall performance out-punches the '59 ever so slightly, with the tiniest amount more edge and bite to notes. We're splitting hairs, though, because the fact is you could play anything from The Shadows, through The Beatles, Hendrix, David Gilmour, SRV and plenty more besides on any one of those guitars. The more interesting observation is how universally grown up and convincing it sounds in any classic Strat environment, not least when compared with any number of Fender's similar looking guitars for far lower prices. On a personal note, this writer has played an American Vintage Strat as his number-one guitar, from new, for over a decade. Having changed the pickups in that guitar, we can say we'd feel no need whatsoever to do it in with this model. And we have to concede that the neck feels better, too: grr.